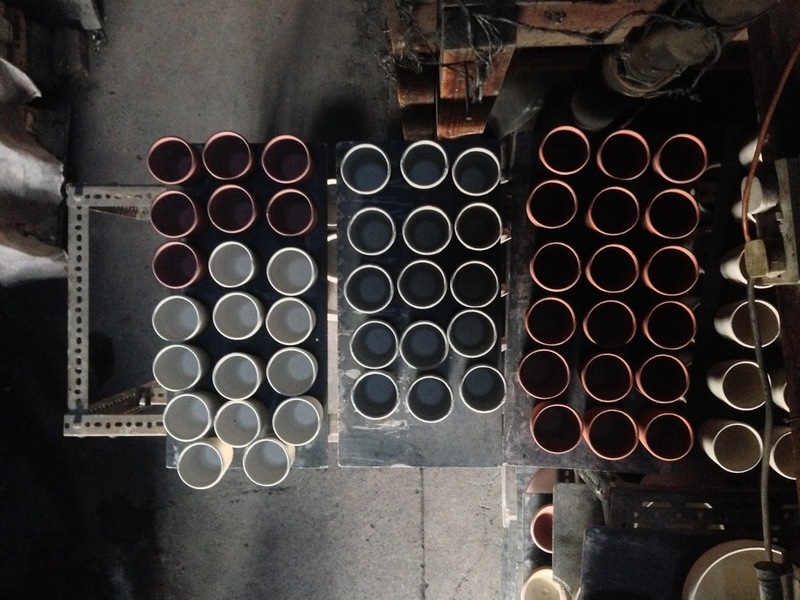 About two weeks after starting at Winchcombe Pottery, much to my surprise, Matt asked me to throw some beakers, not simply as throwing practice for me as the new apprentice but with a view to them going through the firing process and being sold as part of the range. 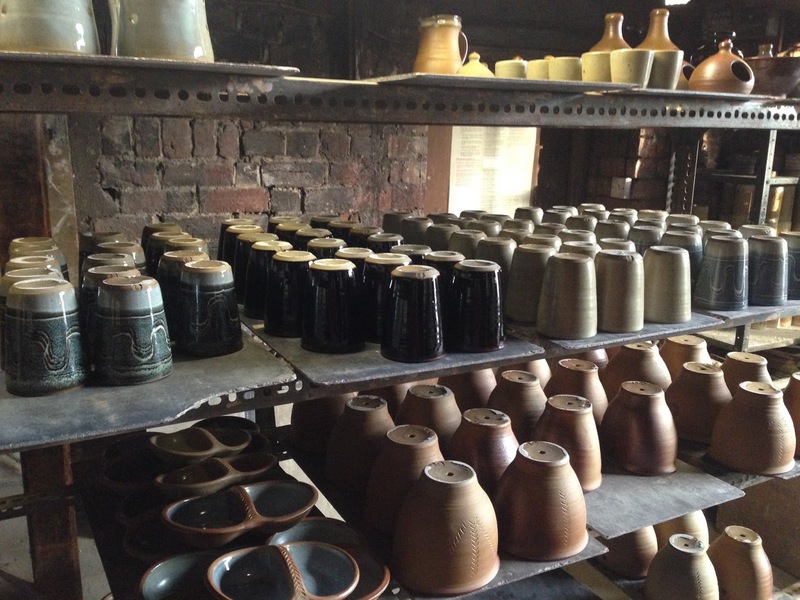 I was amazed and terrified - I had only been involved in pottery for a year and my throwing was not particularly good having never had any real sustained time throwing pots. I was being thrown in the deep end, but now, a few months later, I fully understand the wisdom of it. Being put under pressure, in a supportive but challenging environment and being asked to do things that you think (rightly or wrongly) are way beyond you, is, I believe, the best and perhaps only way to learn a craft. 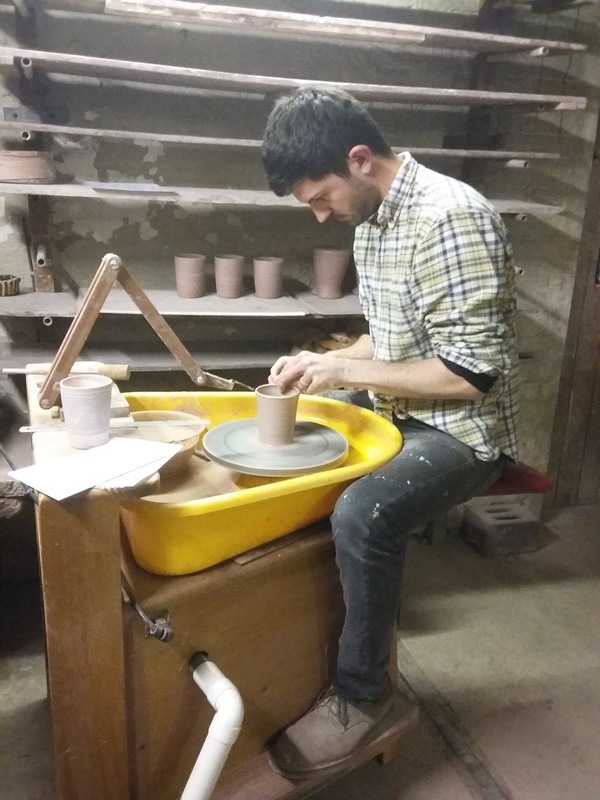 I had imagined that I would need to work for a few months at the pottery behind the scenes as it were and only after quite some time would be allowed to start throwing, and even then away from the pressure and responsibility of making for the range. 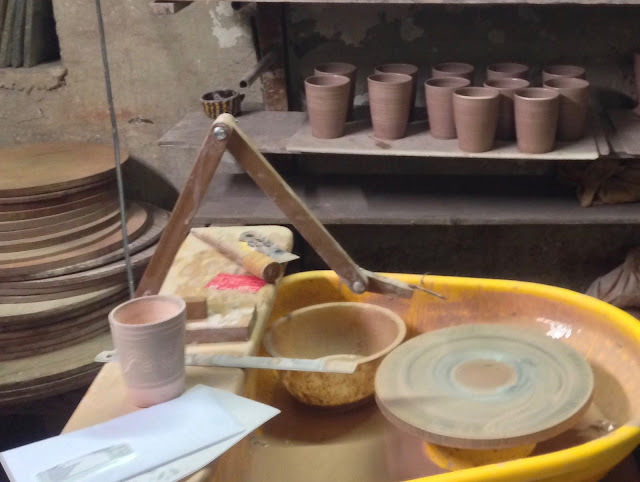 Before this, I had never thrown more than a dozen or so pots at a time and my skill level had stopped me from being very accurate in repeating the same shape. I had to allow for quite a lot of variance in my throwing without being too hard on myself, otherwise frustration would have made me give up. But now I had been given a weight of clay and a set of dimensions to throw to, the same weight and dimensions that all the throwers at Winchcombe had been given before me, and I had to throw the beakers to that standard, no excuses. So, I filled up a board with carefully weighed-out balls of clay, gathered together a basic set of tools, sat down to my spotless wheel with an example in front of me and I threw my first beaker at Winchcombe - a little short, not quite up to the height measurement, not quite the right shape and lacking any real finesse in the way I finished the rim, but I was so grateful to even get a pot of the wheel I was so nervous! Five full boards, each with 18 pots and starting on a sixth. And then I threw another one. Much better shape this time, but still a little short. And then another one. This time managing to get the clay out from the bottom of the pot so I could reach the full required height, but a bit too narrow in the base. Then I threw another, again with some good points and some faults, and then another, and another, and another... And some time later, looking at the shelf next to my wheel, I had filled up a board with beakers - It was quite a rag-tag bunch of pots, but they were there, a document of two hours' worth of serious effort and concentration at a level I had never maintained before. I was exhausted but elated. I went through them with Matt, together we looked at the shapes, discussed what to aim for going forward, looked at some more examples in the shop and the stock room, all made by different makers with their own slightly different personal emphasis on the shape, and then he told me to throw another board. 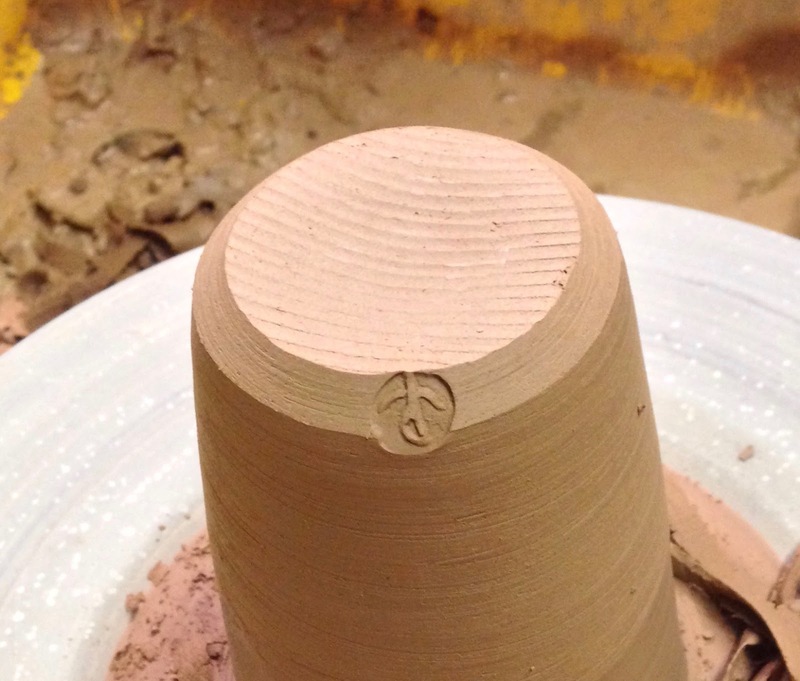 Winchcombe stamps on pots that I had made. After two days, in between countless other jobs around the workshop, I had probably thrown the same amount of pots that I had made in total in the previous 6 months. I could start to see huge improvement in the shape and consistency (still with much room for improvement). I had never been in an atmosphere where my throwing was required before, where it was necessary and where someone else was relying on me to make pots. 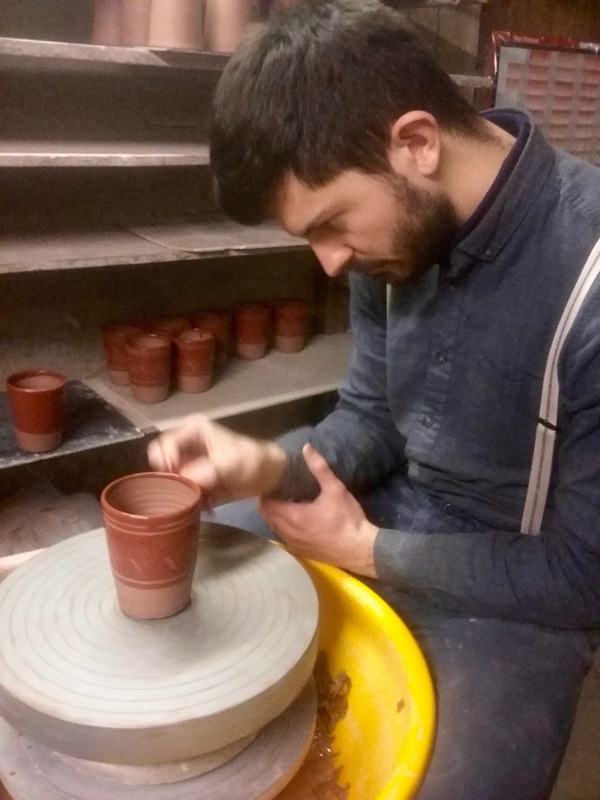 The pressure made me determined to throw them well and I had my first taste of professional pride in my work, with a feeling that what I was making, if it was good enough, could go on to be seen and understood as part of the collective output of a pottery. It was a wonderful and humbling feeling. 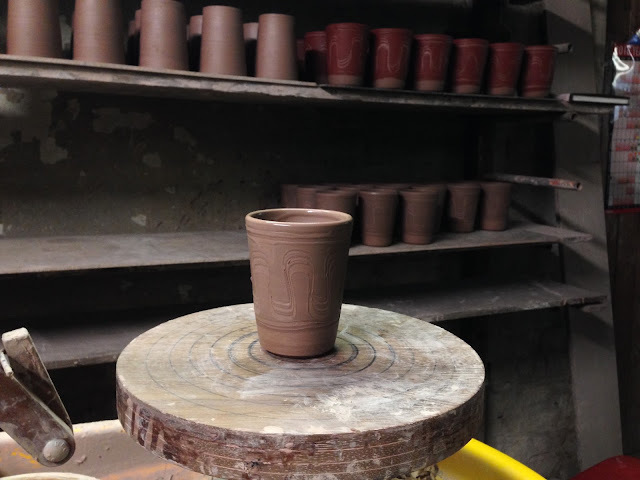 It made me even more determined to continue to improve in my throwing, to earn my place by making beautiful pots. by the other potters, glazed and waiting for a firing. 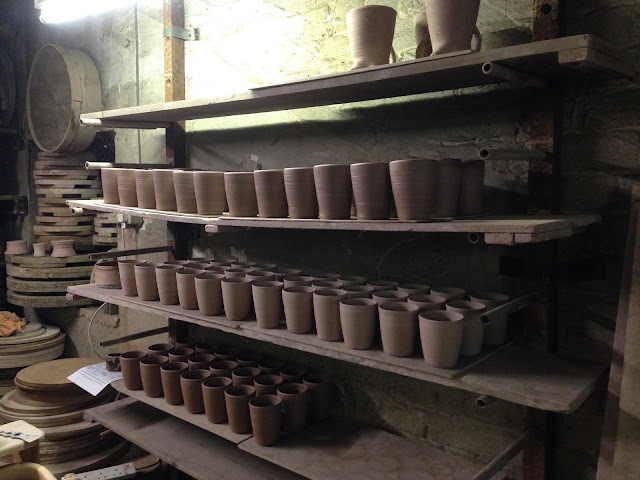 It was a huge thrill when my first pots came out of the wood kiln, especially after being involved in the firing. I kept two of the decorated beakers and as I progress in my career it will be a pleasure to keep them as markers to look back to as some of my earliest work. I have now had my pots in a few firings and have seen them in the shop, personally sold them to customers and had them included in orders. Excitingly, now some of my work is going to be included in Winchcombe's contribution to an exhibition in Tokyo, at Gallery St. Ives, as part of a group show of English slipware. I cannot imagine a time when I will feel complacent about making things with my hands that mean something to someone else. 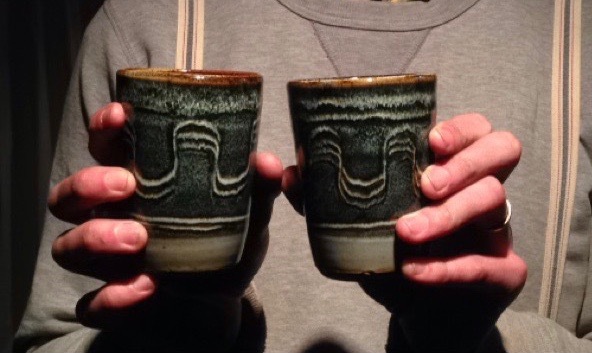 The two beakers I kept from that first firing. 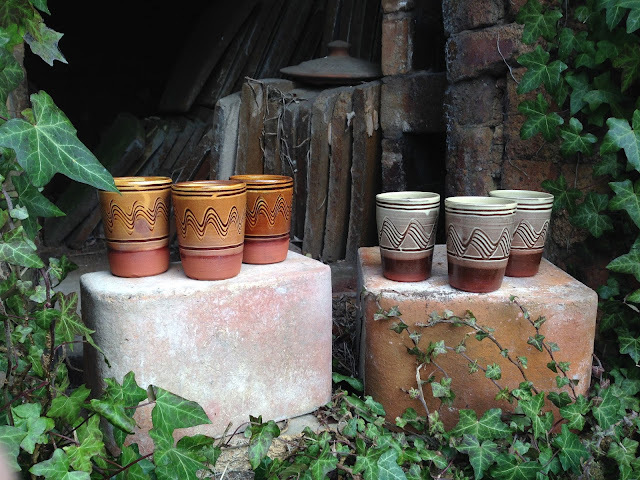 Slipware beakers, with two styles of combing, being sent as part of the exhibition. In amongst all my other responsibilities (mixing and preparing the clay, biscuit firings, glazing, preparing and packing the kiln, cutting and stacking wood, firing the wood kiln, and countless general workshop jobs) I now also throw the plates here at Winchcombe as well as some other pots in the range. The truth of course is that throwing is only one aspect of working as a potter, and within that it is only a portion of what it takes to make an individual pot, but I see throwing in terms of learning a language, a skill that allows you to express yourself - rather than an end in itself it is the means by which you say things, and greater fluency leads to more beautiful work. I have a long, long way to go but I have a real hunger to become a highly accomplished production thrower, knowing full well it will take decades of hard work. I will be forever grateful to Matt for throwing me in the deep end like that. He somehow seemed to know that I would be able to swim even though I did not know it myself.